Yardage is based on 40 ̋-wide fabric. Cutting Note: Each block quadrant requires only 2 fabrics in 2 shapes as a set. I worked with 2 ̋ strips, stacking strips 4 layers high to quickly cut the pieces I needed for each block unit. I used as many different fabric pairs as possible to get the look I desired. I placed pieces in zipper plastic bags for easy transport when sewing on the road. Cutting everything ahead meant that I did not need to travel with a rotary cutter or a mat. Note: The letters in the following instructions refer to the letters on the piecing diagrams. 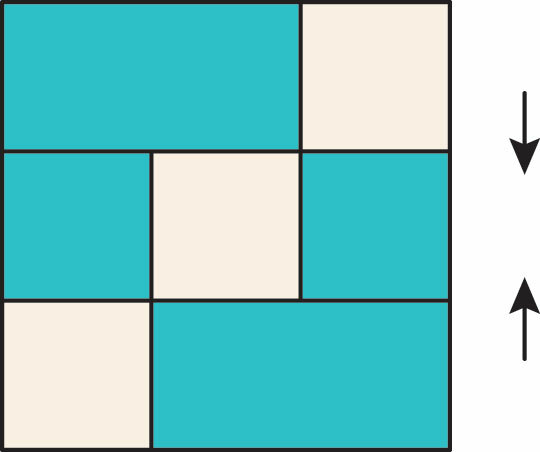 A. Sew a dark 2 ̋ × 2 ̋ square to a light 2 ̋ × 3 1/2 ̋ rectangle to make a block row. Press. Make 2 rows. 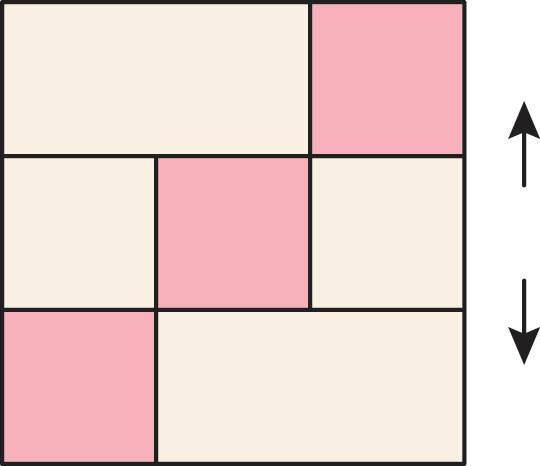 B. Sew a dark 2 ̋ × 2 ̋ square between 2 light 2 ̋ × 2 ̋ squares. Press. Make 1 row. 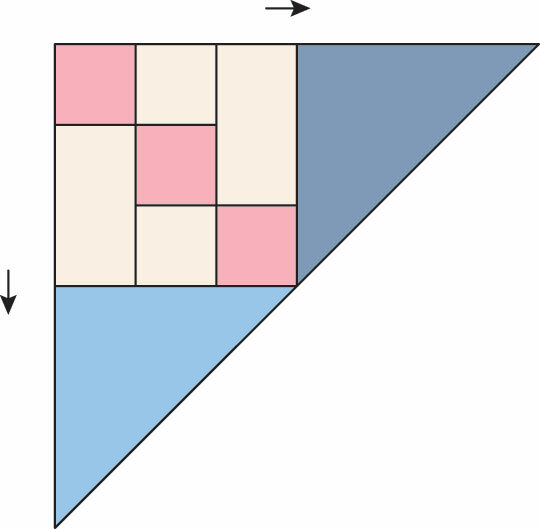 C. Arrange and sew the row of squares between the 2 rows with rectangles, matching the seams to make the quarter-block. Press. Repeat the steps to make 154 dark chain quarter-blocks. 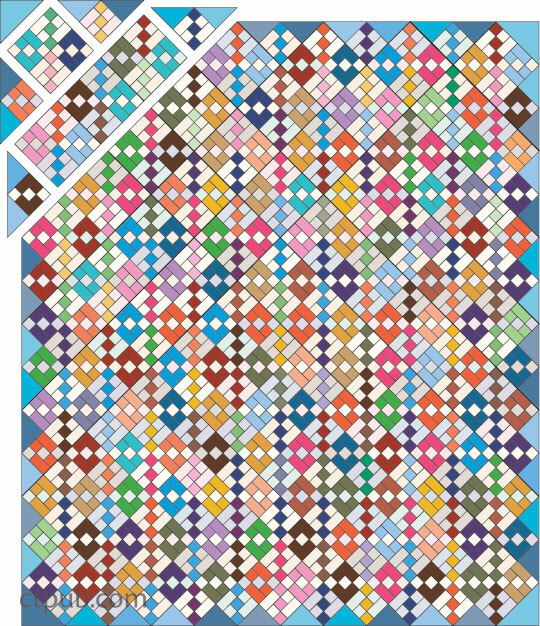 You’ll use 144 for the larger blocks; reserve 10 for the pieced setting triangles. Repeat the steps for the Dark Chain Quarter-Blocks, reversing the value placement so that the quarter-blocks have light chains and dark backgrounds. D. Sew a light 2 ̋ × 2 ̋ square to a dark 2 ̋ × 3 1/2 ̋ rectangle to make a block row. Press. Make 2 rows. E. Sew a light 2 ̋ × 2 ̋ square between 2 dark 2 ̋ × 2 ̋ squares. Press. Make 1 row. 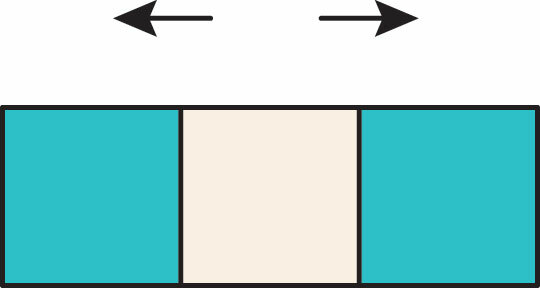 F. Arrange and sew the row of squares between the 2 rows with rectangles, matching seams to make the quarter-block. Press. Repeat the steps to make 156 light chain quarter-blocks. 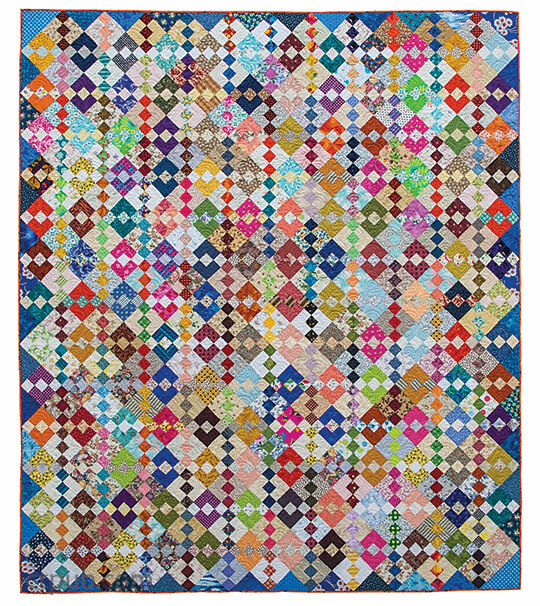 You’ll use 144 for the large blocks; reserve 12 for the pieced setting triangles. G. Arrange and sew 2 light chain and 2 dark chain quarter-blocks together as shown. Press. Make 72 blocks. 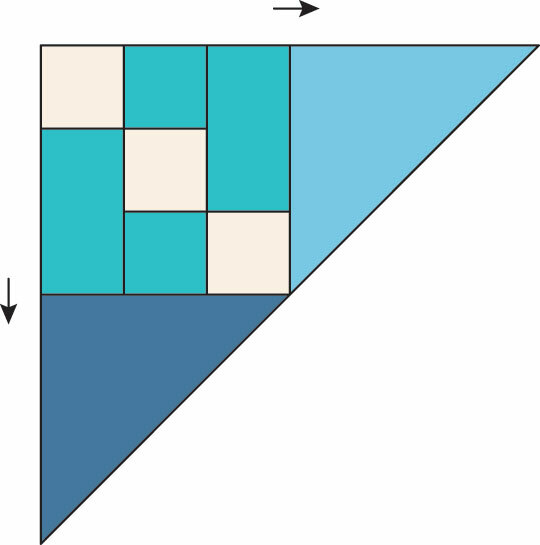 H. Sew a blue side setting triangle to adjacent sides of a reserved dark chain quarter-block as shown. Press the seams toward the triangles. Make 10. I. Repeat the process to sew a blue side setting triangle to adjacent sides of a reserved light chain quarter-block as shown. Press toward the triangles. Make 12. 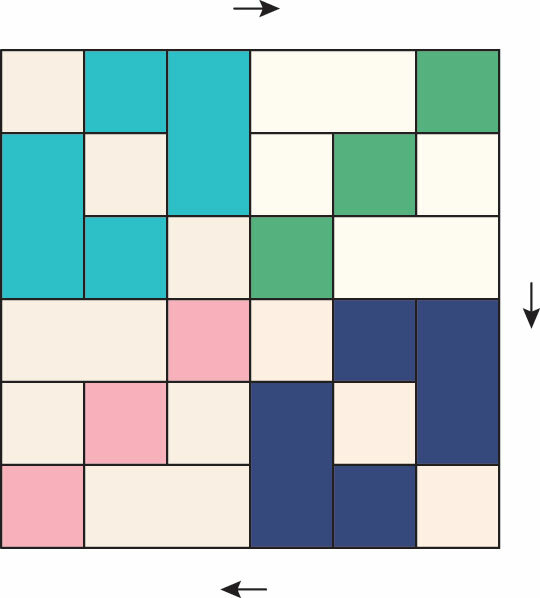 Lay out the blocks in an on-point setting as shown in the quilt assembly diagram; make sure the blocks are oriented correctly, with dark chains running down the quilt from top to bottom and light chains running side by side across the quilt. Fill in around the edges with the pieced setting triangles and corner triangles to complete the dark and light chains. I like to piece diagonally set quilts into 2 sections and then join the sections. This keeps things from being too unwieldy as the quilt grows. Starting in a corner, sew the blocks and setting triangles into diagonal rows. Press seams in opposing directions from row to row to facilitate nesting seams. Join the rows into 2 sections; press the seams in one direction. Sew the 2 sections together to complete the quilt center. Press. 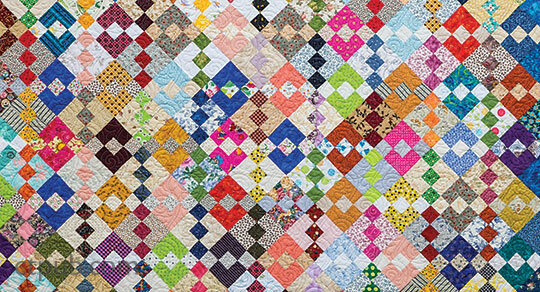 The outer edges of a diagonally set quilt can be a bit wobbly and may need to be trimmed. 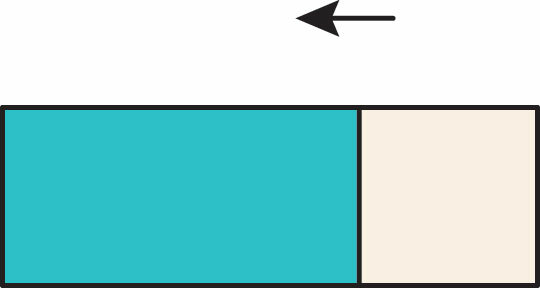 Use a 24 ̋ ruler, placing the ruler’s 1/4 ̋ line where seams cross on the corners of the setting triangles. Straighten the edge with a rotary cutter, leaving a 1/4 ̋ seam allowance beyond the block corners around the edges of the quilt. This helps make sure that the quilt corners are also square. Diagonally set quilts can also be stretchy. Even though the setting triangles have the straight of grain along the outside edge, the blocks are set on point with the bias grain running from top to bottom and side to side. Stop the stretch by staystitching 3/16 ̋ away from the edge of the quilt top, just within the 1/4 ̋ seam allowance. Set your sewing machine for a longer stitch length and do not stretch the quilt top when sewing. Layer, quilt, and bind as desired. I machine quilted Carolina Chain with light blue thread in an edge-to-edge design called Paisley by Patricia Ritter of Urban Elementz. I cut binding strips 2 ̋ wide and sew the binding to the quilt with a 1/4 ̋ seam. This gives me a 1/4 ̋ finished binding that doesn’t nip off the points of my blocks.